Domestic Flights refer to the flights that take place within South Africa’s borders and include destinations such as Cape Town, Johannesburg, Durban, Port Elizabeth and more. Domestic flights vary in price daily due to many factors which the various airlines encounter. We wont bore you with these. What you need to know is what options are available for your domestic flights. Many people will take it for granted that a well branded airline such as Kulula or Mango Airlines bring us cheap domestic flights. This is definitely not the case. Flight prices fluctuate constantly which is where our award winning flight comparison software comes in. It will save you time and money if you use it. Essentially our software compares all available airlines instantly for you you simply choose which flight you prefer from the list given in the search results. Whatever reason you choose to fly, we guarantee the cheapest flights right here. Affordable domestic flights are now right at your fingertips. South Africa has four major low-cost or domestic airlines namely; Mango, Kulula, British Airways and SAA. We have listed them below for your information and some contact details on each airline. Should you wish to find out more information on each airline such as baggage allowances, pets on flights or what sort of food you can expect simply click on the Domestic Airlines menu option and select the relevant airline. 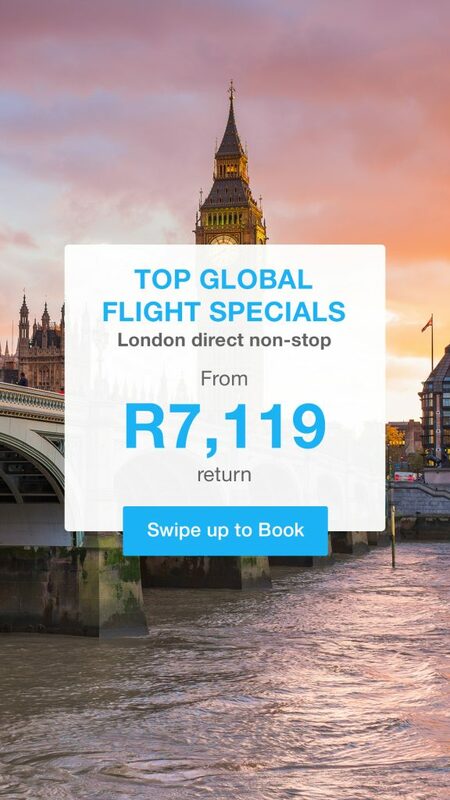 Some of the cheapest domestic flights in South Africa are available right here. We can millions of domestic flights to constantly bring you the best deals. Below are some of the prices our customers are getting for their domestic flights with us. Offers low-cost, single-class flights between Johannesburg’s OR Tambo International Airport, Cape Town, Durban, George, Port Elizabeth, and Nelspruit. Kulula Airlines also offers flights from Johannesburg’s Lanseria Airport to Cape Town, Durban, Port Elizabeth and George. A no-frills carrier operated by South African Airways, Mango offers low-cost, single-class flights between Johannesburg, Cape Town Durban, Port Elizabeth, and Bloemfontein and most recently moving into Africa. South Africa’s national carrier flies locally between Johannesburg, Cape Town, Durban, Port Elizabeth, East London, Bloemfontein, George, Pietermaritzburg, Mthatha, Kimberley, Polokwane, Richards Bay, Upington, Nelspruit/Kruger, Hoedspriut, Phalaborwa, Mmabatho, Manzini and Maseru as well as into Southern Africa, the rest of Africa and the world. It offers economy, business and first class cabins. Operated under the Comair banner, British Airways offers return flights to and from Johannesburg, Cape Town, Durban, Port Elizabeth, and the Kruger National Park in economy, premier economy, business/club or first class. Please feel free to leave your comments in the box below detailing your experiences with Domestic Flights South Africa and the airline that you flew with.